The slowdown in China’s economy is taking its toll on its imports from the Americas, our trade data on China through third-quarter 2015 shows. China’s imports from North America dropped 9%, while its imports from South America were down 11% in September 2015 compared with September 2014. 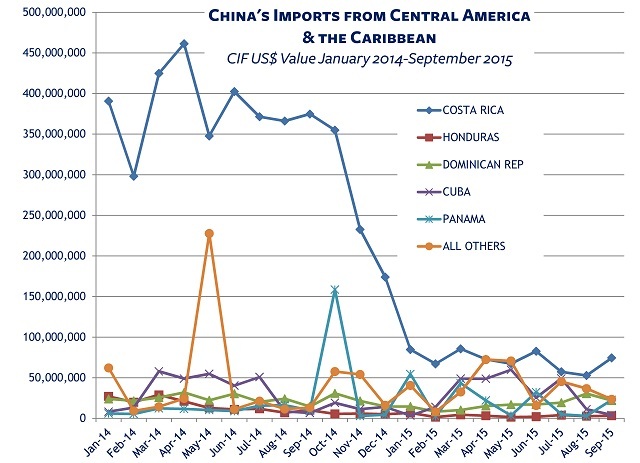 Chinese imports from Central America and the Caribbean plummeted 65% in September 2015 compared with the same month a year earlier. Much of the drop in Central American trade can be attributed to Costa Rica’s loss of Intel’s microprocessor manufacturing facility. In September 2014, electronic integrated circuits and micro assemblies accounted for $310,997,380 worth of China’s imports from Costa Rica, representing 83% of its total imports from the Central American country. By September 2015, imports of HS8542 were down to $13,600,174, representing an 18% share of a much smaller pie. The downward trend is a worry for South American countries that have come to rely on China’s purchases of raw materials and commodities. China is the top export market by value for Brazil, Chile and Peru, and second-ranked export market for Uruguay and Colombia, based on our 2014 trade data on China. Alas, there are indications that China is cutting back on investing as well as imports. Citing data from fDi Markets, the Financial Times reports that Chinese companies were the investors in 286 greenfield projects worldwide, totaling $29.3 billion, in the first three quarters of 2015, down from 351 projects worth $51.6 billion over the same period in 2014. Vigorous growth in China’s investment in and trade with the Americas may be what the future holds, but not, it seems, this year. To dig into the data on China’s import from or exports to any of its trading partners in the Americas, just ask us.